Hopefully! I haven't had that bug rise up again yet. The only bug that still annoys me is tiles/palettes get a little glitchy in the ow. 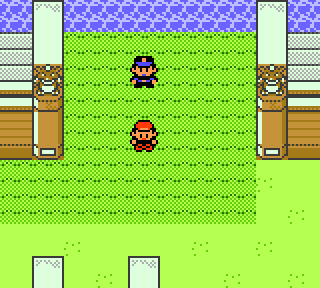 The two most common occurrences for me are in the Viridian City Pokemart when the guy is giving you Oak's Parcel, and on Route 25 when exiting Bill's house... Still no clue how or why that's happening. FroggestSpirit's original code had a ton of checks to prevent this. I removed them in order to speed up the operations to cram as much into the vblank period as I could. This fixed flickering when the screen scrolled up, as you could see in one of froggest's early videos. The overworld bugs are likely due to the game taking longer than usual to reach our custom code, for whatever reason, so the code no longer fits into the vblank period. And writing to vram outside of vblank is a crapshoot. You could test this in more tolerent emulators like, say, gameyob which don't emulate the inaccessibility of vram. Hello Mr.Drenn and Mr.Danny-E 33, thank you for your Full Color Hack. Pokémon Yellow Version is a good GAMEBOY Pokémon game too and I love it very much. Are you interested in the Full Color and Emu Edition Hack of this game with Mr.LocksmithArmy(his romhacking.net address is http://www.romhacking.net/forum/index.p … e;u=15294) ? I think it will be wonderful and amaze every Pokémon fan too ! I always thought the viridian pokemart issue could be related to the trigger. Once the Oak's parcel has been delivered and there's no trigger, the glitch with the tiles never seems to occur. I've also experienced a similar bug in oak's lab when the player is following oak up to get the first pokemon. Maybe the trigger interrupted whatever important function or caused additional work for vblank that it no longer fits the vblank period? As for the palette bugs I was able to fix those in battle by making sure the lcdc interrupt never occured during the build battle pal packet function. Never gotten any palette bug in battle since. I noticed that whenever it occurred between writing the background/hp bar palette and the pokemon palette the pokemon will end up with the hp bar's palette. This is what 266dfc also fixed by not filling the pokemon area with the hp bar palette. I'm looking into it more and I noticed it's because W2_StaticPaletteChanged. W2_StaticPaletteChanged returns from the lcdc interrupt containing 2, but since BuildBattlePalPacket only writes 3 to it before it starts filling any palette data, any palette changes after the lcdc interrput don't get caught. Maybe this could be the cause for ow palettes as well? Yes, that name is better. And feel free to link to your Let's Play in this thread. Also, if you haven't already started recording videos, I am right about to release a new version with several bug fixes. Probably tonight. You can make your Let's Play with this more solid version if you want. Sorry for the late answer! I already shoot 19 ep but only 1 is published. Every Saturday I release a new ep. I'm gonna change the name even if I already shoot 19ep. It gonna start on Ep20. Can I play with the new version but with my old savegame? (Answer to my question) I tried it seems to work but can you still confirm? Yeah that's no problem, saves are no different from the stock game. "After talking about the title of the Let's Play serie with the devs we agreed to change it to: "Pokemon Red Full Color Hack". " I'm glad to see this is still coming along. I'm hoping it will work on the 3DS when injected into the official releases, so that it's still compatible as far as trading and battling with others. Now I'm playing with the new release and I found some color bugs. I remember one it' when you battle the 1 trainer in the Celadon City Gym. When you're fighting the second pokemon the HP bar and the logo in front of hit change their color. I can send you a video to show you. A save state would be more useful than a video. And I don't know what you mean by "logo". Sorry I didn't think of keeping the save state. By logo I mean the letters HP at the beginning of the Health bar. This isn't really a bug, but it is an inconsistency I noticed that I'm not sure was intentional. In the original game, the checkerboard and grass blocks are distinct, but in the color version they blend together. The checkerboard still uses the grass tiles, but I'm guessing each 8x8 tile has a different palette, instead of them all being green like in the color version. And even though it uses the grass tiles, I'm pretty sure it's supposed to be bricks as seen in FR/LG. Also, this block seems to have a white palette everywhere besides Route 23/Indigo Plateau, but that's not as much of an issue. I've finally started work on my full-color version of my hack; however, I'm going to need to know what to do and what not to do when I port everything from my hack into the full-color version thereof. 1. Is it possible to change the color of text boxes and menus so that they are always white? As in in the original and GSC versions. 2. There is graphical glitch when you are about to acquire Oak's Parcel. Some tiles are blue and then turn grey. When you acquire the parcel the tiles shift sideways. 3. The starting credits are not in color. 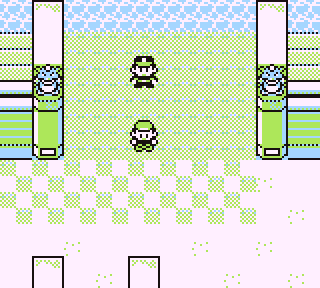 Are you planinng to do a color hack for a rom hack of Pokemon Green? I've just spent the last week working on an update, now released. See the first post. I've fixed all of the graphical corruption bugs I could find. Please please please tell me if you still encounter graphical corruptions with this new release (v1.2), even small ones. A lot of other things were changed, see the changelog. Even that's not complete. Lots of small things were fixed. I've extensively tested this on real hardware. By "extensively", I mean I did a basically normal playthrough. I'm kinda sick of this game now, but it allowed me to catch several issues I otherwise wouldn't have noticed. Anyway, I can say with 99.99% certainty that it doesn't actually damage gameboys, so I removed that warning. The source is all there. You need to go into constants.asm and set "GEN_2_GRAPHICS" to 0. I don't have any plans to do another version with green sprites, but it should be simple to do if you have access to those sprites - just incbin the new files. Though it may be necessary to adjust some of their dimensions too, not sure.